Cadem Law Group, PLLC, has the understanding and compassion necessary to assist those facing significant financial problems. Whether you are facing foreclosure, considering bankruptcy, or simply wish to defend against a creditor’s claims, we are here to help. Minnesota Lawyer Magazine recently reported that there has been a flood of unqualified attorneys taking on bankruptcy cases due to the increased demand for debt relief assistance. Many of those attorneys lose sight of the defenses available to many debtors and instead rush them to bankruptcy. However, such a decision can have lasting negative effects on employment, credit, and personal relationships. 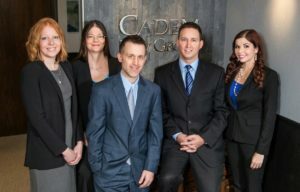 Cadem Law Group will help you work through your financial issues and explore all possible solutions to your problems before considering such final steps as bankruptcy or foreclosure. In many instances, loans can be reworked; lower balances can be negotiated; and foreclosure actions can be defended (even if you have missed multiple payments). In the event that bankruptcy is the best option, our office has streamlined the process to make it as hassle-free as possible. Contact our office online or call 218-739-HELP (4357) today to schedule a free consultation to discuss how we can help. Key Practice Topics: Bankruptcy; Chapter 7; Chapter 11; Chapter 13; Credit Counseling; Foreclosure; Right of Redemption; Creditor; Debtor; First Meeting of Creditors; 341 Meeting; Note; Security Agreement; Mortgage; Variable Interest Rate Adjustment; Workout Agreement; Debt Settlement and Compromise; Demand for Presentment; Arbitration Clause; Original Note; Mortgage Release; Satisfaction of Debt; Foreclosure by Action; Equity Stripping; Foreclosure by Notice; Publication of Notice; Jurisdiction; Proper Notice to Quit; Notice to Vacate; Tenant’s Rights; Home Equity; Second Mortgage; Interest Rate.